Heat Pumps | Frontline Electrical, Call Us Today for Your Free Quote! Top Quality Brands Including Toshiba, Panasonic and Mitsubishi. 5 Year Manufacturers Warranty On All Heat Pumps! Heat Pump Quotes Within 48 Hours! Heat Pumps Installation Within 14 days! 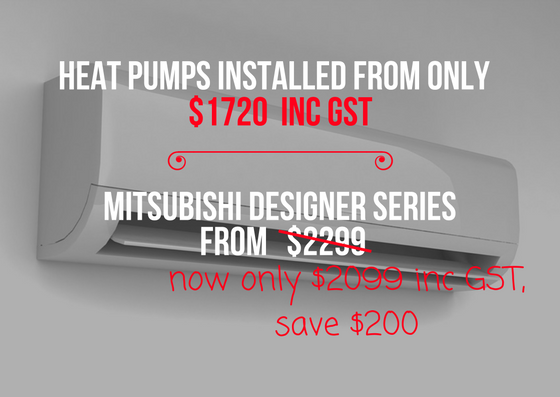 Mitsubishi Designer Series was from $2299, NOW ONLY $2099 inc GST Save $200! Mitsubishi Black Diamond Technologies, backed by NZ’s Number 1 customer support team! Call Us Today for Your FREE, In-Home Consultation and Quote! Heat Pump Quotes Will Be Provided Within 48 Hours! Feel cosy and warm in winter and cool in summer. Remove moisture from the air and prevent mould and damp windows. Frontline Electrical will work with you to get the right heat pump system and create the perfect environment in your home or office. We help you to select the right heat pump for your room size because we give the correct advice about the size, capacity and installation costs for air conditioning and heat pumps to suit your requirements. Frontline Electrical brings a wide range of heat pump installation experience. We also offer you a full range of heat pumps and air conditioners. We only use top quality brands such as Toshiba, Panasonic and Mitsubishi. With Frontline Electrical you get the assurance that a fully certified electrician will carry out your heat pump installation to the highest safety standards. You can count on Frontline Electrical to install your air conditioning or heat pump with no hassles, on time and at a great price. We will recommend the best heat pump solution to provide the most cost effective heating for your home or office needs. There’s no need for your comfort to cost the earth and you will save on home heating energy costs!